What sustainable practice are you most proud to utilize at Bouquet Restaurant? I would say what I’m most proud of is our obsession with working with as many local farmers and producers as possible. 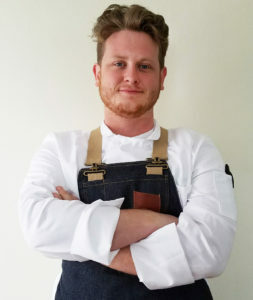 Chef Stephen Williams has really created a culture in our kitchen where we try to adapt to what our local farms can provide us, and our job is to apply techniques to highlight their work. Tell us about your experience participating in Bouquet’s collaboration with the Midwest Culinary Institute (benefitting Chefs Collaborative’s education fund). My experience with the culinary school collaboration was fantastic. It’s really inspiring to see fellow students with different experience levels and backgrounds working from start to finish on a dish. It was very rewarding to be a part of. How do you Change Menus in order to Change Lives? I work within my sphere of influence, so my friends and family are the ones I directly engage with. For example, my mom never really showed a lot of interest in food. It just wasn’t her passion. 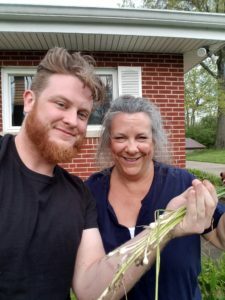 But last week I come over, and she excitedly shows me how she’s collected wild onions in the back yard! That was a really special moment for me, because it felt like my passion was rubbing off on others. What did you learn / what were your biggest takeaways from Adam Danforth’s Meat Science event in Cincinnati last March? The Meat Science event was incredible. Adam has this overwhelming depth of knowledge and passion for what he does. Beyond being inspired by that alone, I really took away his point about flavor over tenderness. Mind you, this is my interpretation, but he discussed how commercial meat has conditioned a lot of people to value tender meat that doesn’t necessarily have a lot of flavor or character. Where as, properly raised animals have a depth of flavor that represents the region they were raised. And that seemed very special to me.